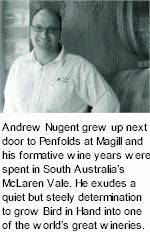 Cabernet Sauvignon by Bird In Hand of Adelaide Hills. . Andrew Nugent grew up next door to the ancient Penfold wineworks at Magill. Only ever made of the finest vintages, growing season 2013 yielded a mere 800 dozen individually numbered bottles of Nest Egg Cabernet Sauvignon.